Mikaela Shiffrin Photos, News, and Videos | Just Jared Jr.
Mikaela Shiffrin turns heads on the red carpet at the 2014 ESPYS held at Nokia Theatre L.A. Live on Wednesday night (July 16) in Los Angeles. “Trying to be #artsy and TOTALLY GEEKING OUT. #espys #dontevergiveup #LAbaby,” the 19-year-old gold medalist tweeted just ahead of the event. Mikaela was joined by her Winter Olympic team Ted Ligety, Joss Christensen and Maddie Bowman, plus gymnast Nastia Liukin. Jamie Anderson and Sage Kotsenberg, who both won the US’s first gold medals in snowboard slopestyle, took home the Best Female and Male Olympian awards. FYI: Nastia is wearing an AQ/AQ bralet and a Khirma Eliazov clutch. 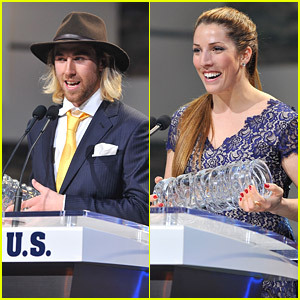 Sage Kotsenburg & Erin Hamlin: Big Winners at #BestofUs Awards 2014! Sage Kotsenburg and Erin Hamlin step on stage to accept their awards during the 2014 U.S. Olympic Committee’s Best of U.S. Awards held at Warner Theatre on Wednesday night (April 2) in Washington, D.C. The gold medalists picked up the Male and Female Athlete of the Winter Games! Other winners include Noelle Pikus-Pace won Moment of the Olympics, the Sled Hockey Team won Team of the Paralympics, Alpine skiers Mark Bathum and Stephanie Jallen were named Male and Female Athletes of the Paralympics. Other attendees include Joss Christensen, Gus Kenworthy, Devin Logan, Kaitlyn Farrington, Hilary Knight, Julie Chu and Mikaela Shiffrin and gymnast and summer Olympian Aly Raisman. Mikaela Shiffrin and Bode Miller pose with their teammates at a photo shoot during the 2014 Audi FIS Alpine Ski World Cup Finals on Thursday afternoon (March 13) in Lenzerheide, Switzerland. The two Olympic medalists were joined by fellow medalists Julia Mancuso, Andrew Weibrecht and Ted Ligety. The next day, the team competed in the Team Event where they placed second, just a few points below Team Switzerland. Mikaela and Alexis Pinturault of France were also honored at the event as the Longines Rising Ski Stars. Mikaela Shiffrin raises her hands high after topping the leaderboard for Alpine Skiing Women’s Giant Slalom at the 2014 Sochi Winter Olympic held at Rosa Khutor Alpine Centre on Friday night (February 21) in Sochi, Russia. The 18-year-old athlete grabbed the gold medal ahead of Marlies Schild and Kathrin Zettel, both of Austria, and made Alpine Skiing history as the youngest ever winner of an Olympic slalom gold medal.